While Michael Heseltine is without doubt a compelling figure within the realm of late 20th-century British Conservative politics, he is definitely not a compelling writer. This might be forgivable--he mentions never having enjoyed reading throughout his life, due to his mild dyslexia, which would certainly hamper one's skills as an author as well--but it still makes the reader's task a rather miserable one. The book does provide detailed chronologies of certain events like the Westland affair, which will doubtless prove useful to political nerds and other policy wonks interested in the relationship between the government's defence and business interests, and the nature of collective cabinet responsibility. What the book doesn't provide is a readability for the layman, though. For an autobiography, it also offers surprisingly little insight into the mindset of the author at certain key points in his political career and his personal life. Virtually the entire book reads like a rather detached chronological recitation of events, or a dry regurgitation of policy. It is certainly a potentially useful document for the political historian...it just isn't a very interesting one, which is a shame, seeing as it comes from such a colourful character. 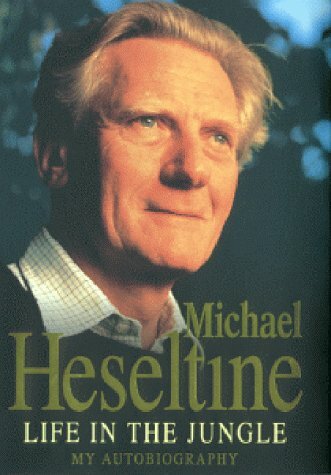 Heseltine forgoes the usual anecdotal and gossipy style of a politician's autobiography in favour of an exceedingly detailed account of his professional and political life, with particular focus on his actions in various departments and his part in the Westland affair that led to his surprise resignation in 1986. The book may come across as overbearingly self-possessed on more than a few occasions, but then again few people would accuse its author of having a false sense of humility.